I’m very happy to announce that today, I am a guest at one of my favorite blogs, A Culinary Journey with Chef Dennis. Chef Dennis and I started blogging at around the same time but I wouldn’t hesitate to say that in terms of popularity, he has eclipsed me by leaps and bounds. Why? His recipes are fabulous and more importantly, he’s one of the nicest guys you will ever meet. I know because I’ve had the pleasure of meeting him in person a couple of times. His site is a wealth of information not just about delicious food but if you’re a food blogger, he’s done all the homework about blogging etiquette, social media, stats and everything else a blogger loses sleep over and he’s generously shared it all in his blog. For my guest post I wanted to share something that wouldn’t disappoint Chef Dennis and his readers so I decided to go with another madeleine recipe. They are my latest obsession not just for their simplicity but also for their versatility. For my first attempt I prepared these Chocolate Madeleines from Pierre Hermé. This time, I decided to go the more traditional route but I couldn’t resist offering my own little twist. I would love it if you would visit Chef Dennis to see my Honey Mango Madeleines. If you end up lingering for, oh, an hour or so drooling over his delicious recipes and engaging manner, I wouldn’t blame you one bit! Update: Recipe is available on this page, too. Sift together the flour and baking powder in a bowl and set aside. Using a hand mixer fitted with the whisk attachment, beat the eggs and sugar together on medium-high speed for 2 – 4 minutes, or until the mixture is light and fluffy. Beat in the honey, then the lemon zest and vanilla. Using a large rubber spatula, gently fold in the dry ingredients. Stir into the melted butter the two tablespoons of tea before also folding into the dry ingredients. Cover the batter with plastic wrap, making sure to press the wrap against the surface of the batter so it creates an airtight seal. Chill the batter for at least 3 hours—this will keep in the refrigerator for up to 2 days. Preheat your oven to 400 degrees F. Butter your madeleine pan and dust it with flour, shaking off the excess. Even if you have a nonstick pan, it is recommended that you do this. Divide the batter among the molds, filling them almost to the top. There’s no need to smooth the batter, baking will settle it into the molds. 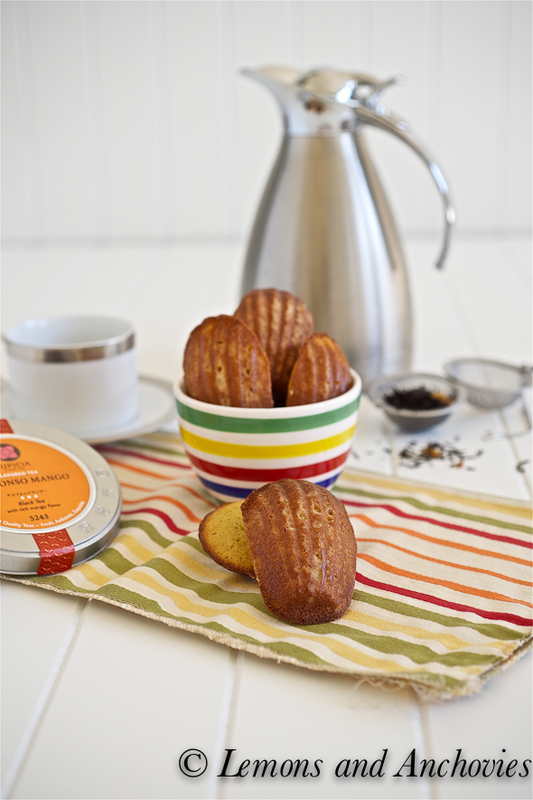 Bake the madeleines for 11 – 13 minutes (if you have a mini madeleine pan, 8 – 10 minutes) or until the cakes are puffed and golden and spring back when touched. Remove the pan from the oven and rap the pan lightly against the counter to release the madeleines. Cool the madeleines slightly on a wire rack. They are best when still a bit warm or at room temperature. Makes 12 regular-sized madeleines. Oh my goodness! Your recipe of Mango Madeleines greeted me first thing when I turned on my system today! HOW MARVELOUS! I love it & must definitely try it. What do you think about my using fresh mango puree instead of mango-flavored tea? I have a case of fully ripened mangoes right now. Tempted to try your recipe today! Thanks for sharing. I just came from Chef Dennis’ site & will head back to get your recipe. Love your new look, Jean. The site is awesome. Cheers! 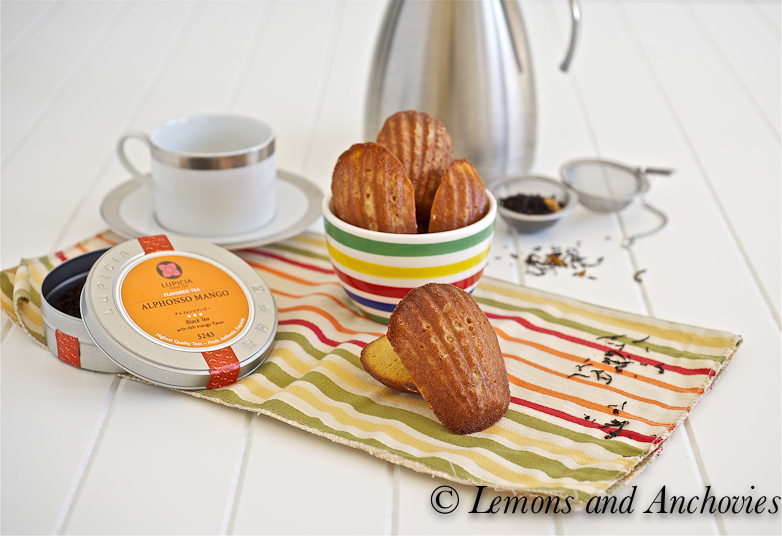 I saw a photo of the Madeleines on Pinterest before I read about them anywhere else and instantly recognized them as something from the Lemons and Anchovies kitchen. 🙂 I love mango tea so I know these are a winner. Thanks as well for the introduction to Chef Dennis and his blog. Have a great weekend, Jean! Laura, really?! 🙂 That is so nice, thank you! So glad you like the madeleines. You’ll love Chef Dennis’s blog! Congrats on the guest post, Jean! Love these little beauties! Will check your guest post shortly!!! 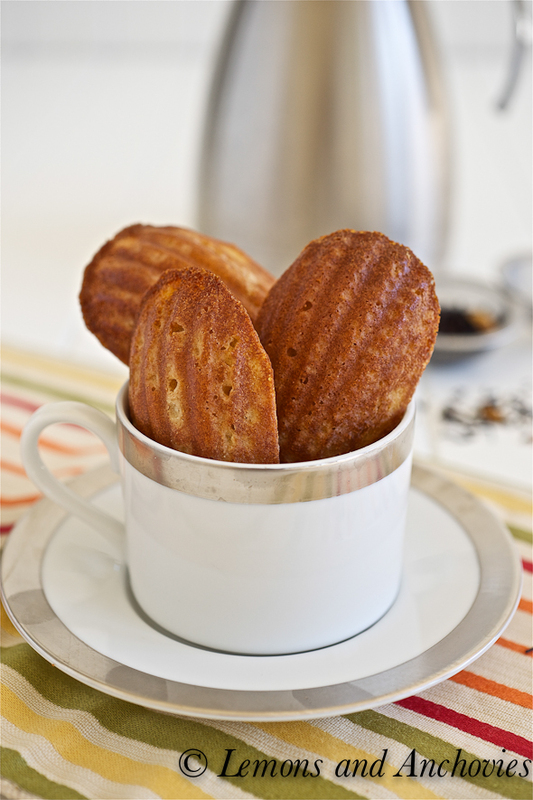 I absolutely love the flavors in these madeleines! My mom just gave me an old madeleine pan and I can’t wait to use it! thank you so much for all your hard work on such a delicious guest post,! Your Madeleines are truly inspiring, I always thought they were way above my skill level, but now that I have a trusted recipe to follow, I may have to give them a try! Lovely guest with Chef Dennis and your madeleines look totally delicious. I wish someone would bake these for me. That mango tea flavor makes a very nice addition. 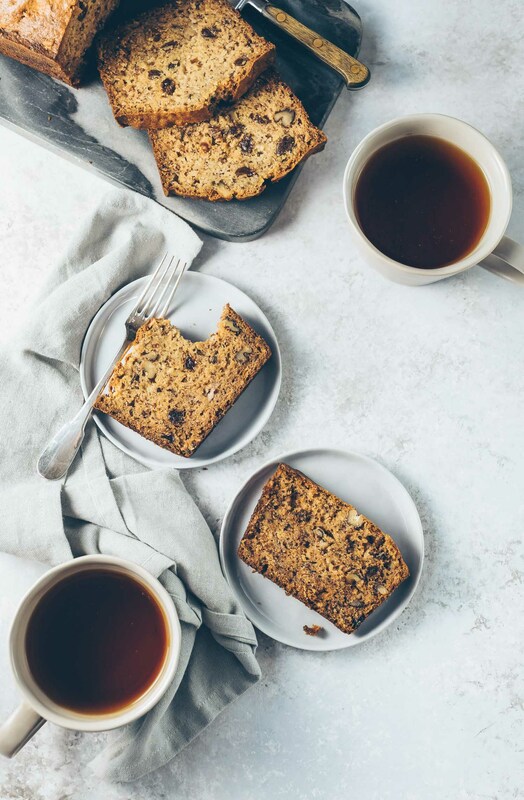 Another lovely cookie recipe which is making it hard to resist to buying a pan 🙂 Love your posts Jean you are such a great photographer and cook. Stopped by to complain. Today I made your coffee chocolate cake and it was the second time we end up eating it before I get to frost it. You have to tell me the secret to keep sticky fingers away from it so I can make it pretty and share a photo of it. Damn, it’s so good! Oh, Roxana! I’m so glad you liked the cake. 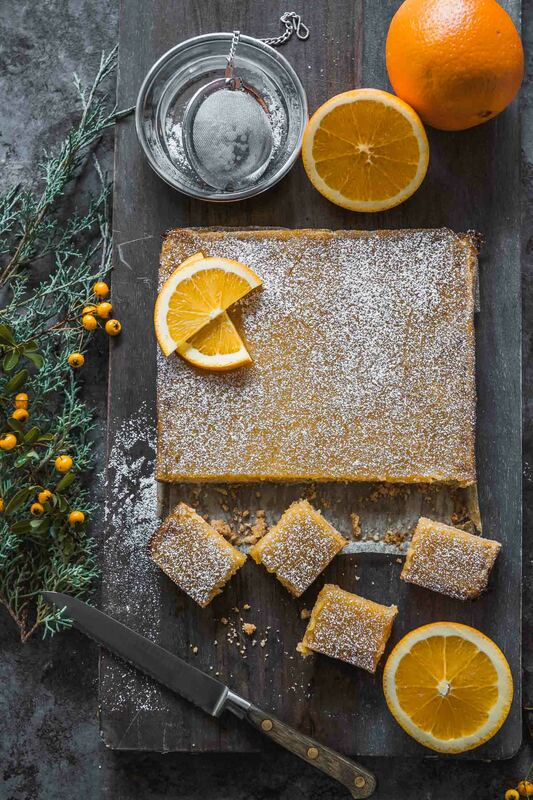 It is my go-to cake–it’s foolproof! My only advice is to bake it when no one’s home or when your little one’s taking a nap, LOL! Beautiful madeleines Jean! I love Lupicia tea! I’ve never tried mango one before. Off to check Chef Dennis’s blog…. Nami, do you ever go to the shop at Westfield San Jose? I could stay in there for hours. Plus, I love sampling a different tea each time I drop by. I haven’t had one that I didn’t like. They have a Chocolate Tea that is awesome! These are just beautiful! I’m off to Dennis’ place to check it out! OMG heading over Chef Dennis right now! these look incredible!! Look at you on top of working so hard, you made these over the top yummy cookies for the chef. I will peek over there in the morning. I’ve been working a ton too and running my daughter all over like crazy. Can’t wait for another get together. I’m thinking maybe you can bring the madeleines. Lovely, lovely madeleines! The mango flavor is such a great idea!